Spain has been an interesting contrast with the other countries in which we have lived over the past three years. As we prepare to move on, it is natural to reflect on the high points and the low ones. Here are some thoughts about what I most enjoyed and least enjoyed about Spain. I find it incredible that dog owners in towns all around Spain do not clean up after their poopy dogs. There are piles of dog crap on almost every sidewalk of every block of every town I have visited. The big cities like Barcelona, Madrid, Seville, Granada, and so on, are well-enough funded to have maintenance employees in the city centers who pick up pet poop along with garbage. Not so in the other areas of the towns. If the people of Spain had any idea how disgusting it is to tourists to have to dodge these piles, and how poorly it reflects on their country, they might do a better job of enforcing dog sanitation regulations. Thank goodness dogs are outlawed on the beaches! Our finest friends in Spain were the Brits, Mike and Ruth, on either side of me. 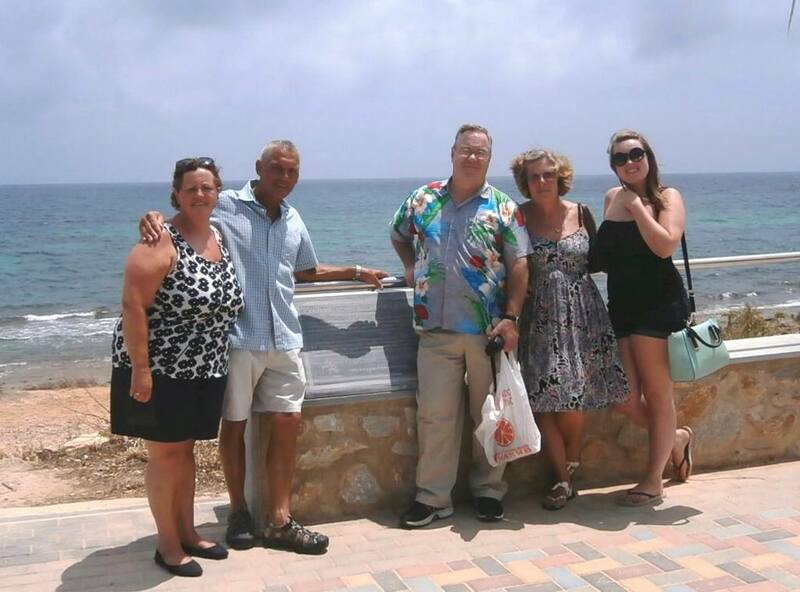 Joining us were their friends from England, Debbie and Hannah at the site of a Roman quarry in La Torre. We have made friends in every country we have visited, and Spain was no exception. It is always the memories of places and events shared with locals and fellow travelers that seem the most vivid. Even if we never see some of these friends again, we will never forget the kindnesses they have shared with us that made our time in Spain memorable. There are poor people in every country, but that is no reason to forget about them. The poor economy hit Spain harder than most industrialized countries, and they have lagged behind the rest of the world in recovering. Personally, I think Spain has the resources it needs to take care of its people. Unfortunately, much of the revenues that flow into the economy seem to get siphoned off through corruption and unethical business practices. When Spain recently announced Felipe VI as their new king, he proclaimed he would work to achieve greater equality and more opportunities for the unemployed and the needy. I hope he has the influence, the leadership and the integrity to bring about these benefits for his people. The Central Market of Torrevieja, where I purchased dried figs and apricots. 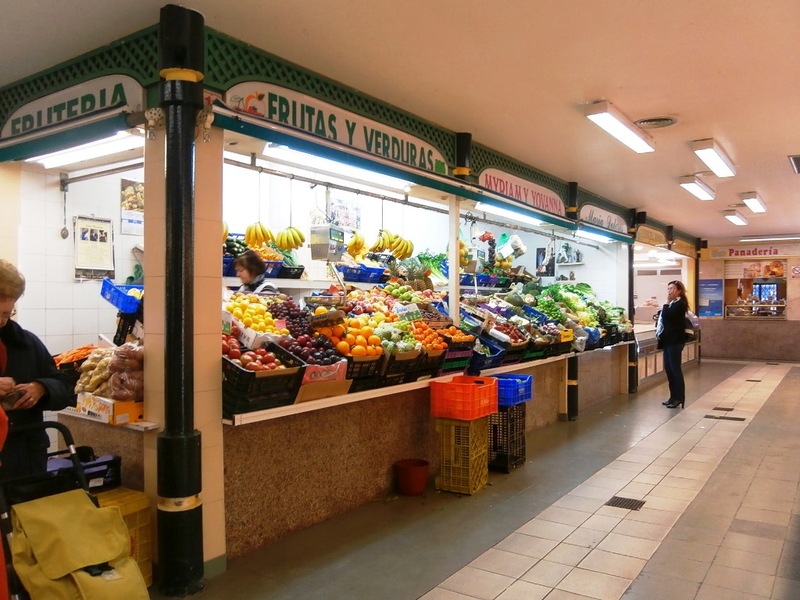 I love fresh markets, and Spain is a fantastic place to find countless varieties of fruits, nuts, vegetables, olive oil and prepared foods to meet most people’s tastes. The land is fertile and productive. There is no reason for the people of Spain to ever go hungry. We also learned they make delicious chocolate in Spain! In the resort towns along the coast, there is little concern about personal safety and security. I have never felt unsafe walking alone or with my wife. And even though we were never directly approached in the big cities – Madrid, Barcelona, Seville, Granada, Cordoba – we were always cautioned to be on the lookout for pickpockets. This was especially true in the bus and train stations whenever we were toting luggage. After having my wallet lifted in Rome, I have become more vigilant about watching out for thieves. They have become quite sophisticated in some instances. For example, I witnessed a well-dressed man in a fine suit carrying a clipboard and hanging around our hotel in Granada while the tour buses were unloading. When he saw that everyone remained standing next to their personal bags and he noticed my wife and I were watching him, he walked away. 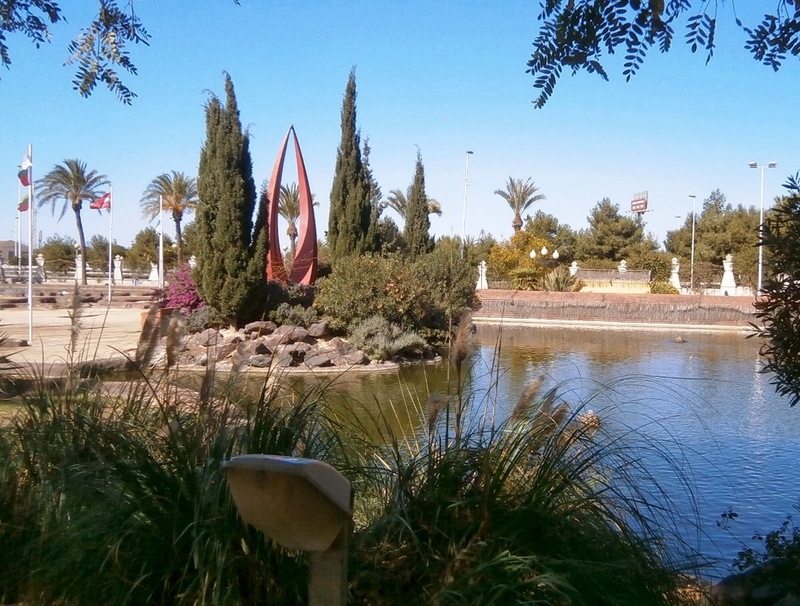 A typical sunny day at one of Torrevieja’s many local parks. Although the Costa Blanca has experienced its worst drought year on record and there have been dozens of brush fires in the surrounding countryside, it has been pleasant living on the coast just a few short blocks from the beach. The evening breezes coming of the Mediterranean Sea are cool and refreshing. In fact, we have seen rain here on the southern coast of Spain just a handful of times during our stay. We have been most fortunate weather-wise when we take into account that Madrid received over a foot accumulation of hail on July 3rd. The traffic on the freeways feeding this city of 3.2 million was brought to a standstill and the precipitation eroded the track of the high speed train from Alicante to Madrid. The Metro subway and the airport were flooded forcing delays and diversion of flights. I am grateful that we live on the Costa Blanca where it was 85°F and sunny. There is something for everyone in Spain, and I am sure I will think of more things I could have added to this list after we leave. Suffice it to say Spain should be on your list of countries to visit. Should you decide to go, I will be watching for your stories so that I might reminisce about our time in Spain. 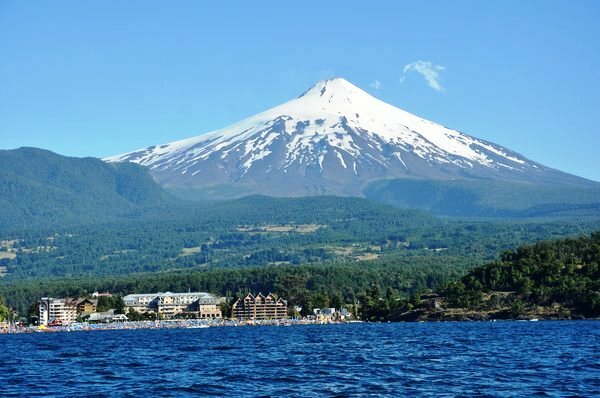 Buen viaje! In just a few short days we will be departing Spain, and I am reflection on our experiences here as we prepare to leave. Spain has impressed me in a number of ways – some good and some not so much. Many of these impressions will become my memories of Spain, and I share them here with you. 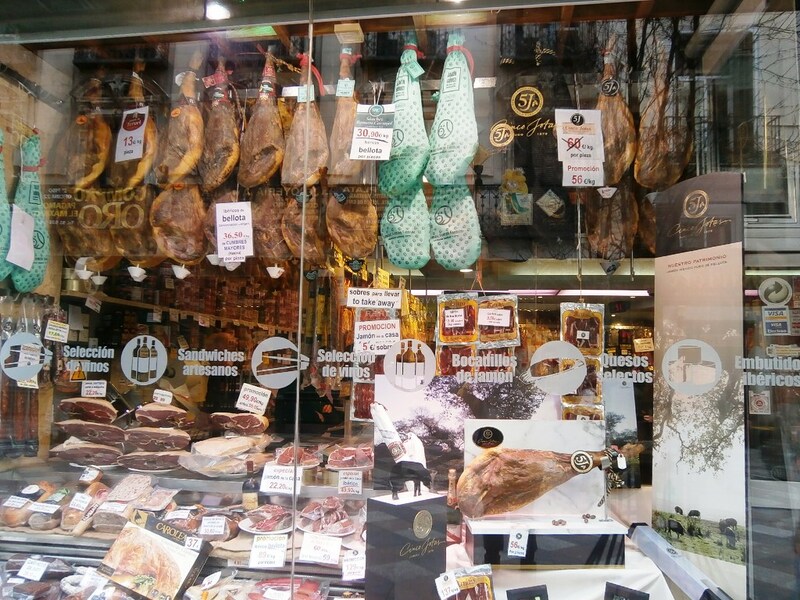 A typical delicatessen in Spain offers whole or cut cured hams and many varieties of cheese. The selection of fresh fruits and vegetables and the varieties of market-fresh meats, cheeses and fish in Spain are remarkable. Prices can vary a lot compared to what I am used to seeing in the U.S. and the U.K. The most inexpensive fruit is oranges. The flatlands near where I live have orange groves that spread as far as the eye can see. Restaurants and sidewalk vendors offer fresh-squeezed orange juice almost everywhere in the country. The most expensive food item is ham, which is a story in itself. There is cured ham you can buy at a deli counter (jamón cocida), and cured hams sold as an entire leg (jamón ibérico and jamón serrano). A ten pound leg can sell for $100 at the local meat store or run as high as $500/pound for the gourmet stuff. These hams look remarkably similar to prosciutto, but they are not the same. One of Spain’s major contributions to world cuisine is paella, a pan of rice cooked with spices, vegetables, seafood, chicken or meat. It is a staple on many restaurant menus and a good choice for a large group. I like to think of paella as comfort food like how Americans eat macaroni and cheese or a bowl of chili. It is not a gourmet dish, but it can be quite tasty. I also have to mention tapas. Some have been quite good. Most have been mediocre. 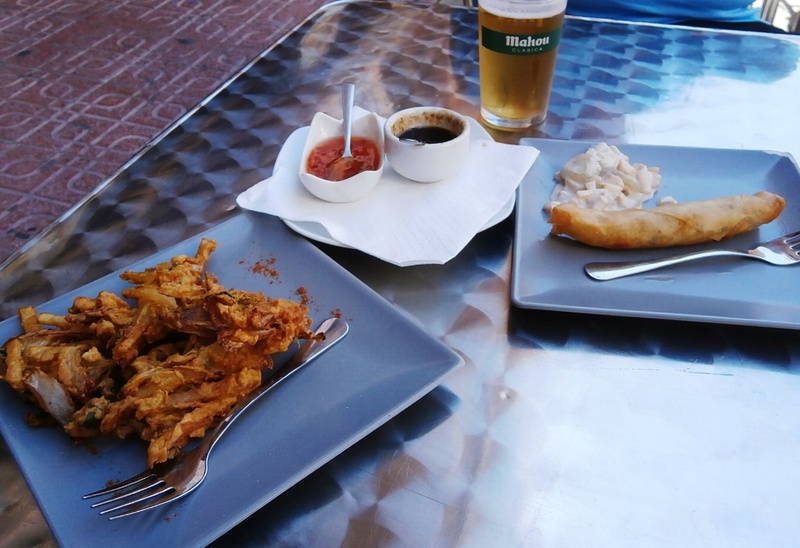 I think of tapas as better-than-average bar food – something to snack on with beer to take the place of preparing a regular dinner. We have made a number of friends during our time in Spain, and every one is from another country – Portugal, Colombia, Cuba and England. None are native Spaniards. Although I live in an all-Spanish, non-English speaking neighborhood, only one person ever smiled or greeted me with a simple ‘Buenos dias’. One good thing is that people give us space and do not impose themselves. Still, I have to wonder if the locals are just not all that friendly. Perhaps the beach towns have been so overrun with expats for so long that the locals are numb to outsiders. Since joining the EU, Spain has experienced the flood of northern European expats and seen the cost of real estate soar. Most of the coastal areas of Spain are now a string of resort towns. Tourism dictates the local economy, and our city of Torrevieja is no different. 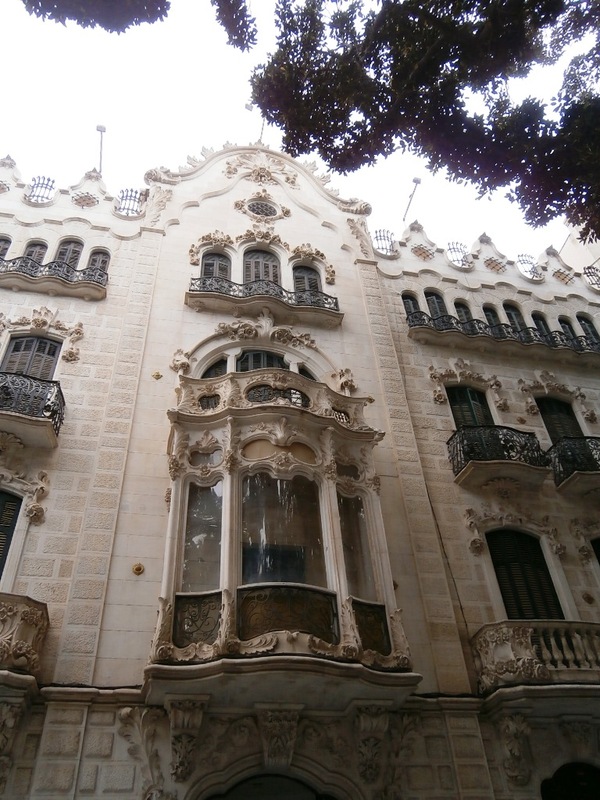 Elaborate exterior décor adds to the elegance of the architecture in Spain’s fine cities. Spain has played a central role in the history of civilization from the ancient Iberians to the Phoenicians, the Carthaginians, the Romans, the Moors, the Catholic monarchs, the global explorers, the conquistadors and the rise and fall of the Spanish Empire. Like other countries, Spain was built in layers, one on top of another. Most of the architecture in the cities now reflects the elegance of 19th century facades with many fine parks, plazas and pedestrian walkways. We have enjoyed the quirky grandeur of Anton Gaudí architecture in Barcelona, the mosque cathedral in Cordoba, the Gothic cathedral in Seville, and the classic beauty of the Royal Palace in Madrid. We have seen the Roman amphitheater in Cartagena, the Alhambra in Granada and the fertile countryside filled with vineyards, olive groves, almond orchards and fruit trees. There is a sense of grandeur in Spain that rivals any of the Old World countries, and their culture lives on through traditional music, dance, bullfighting, art and a modern-day monarch. 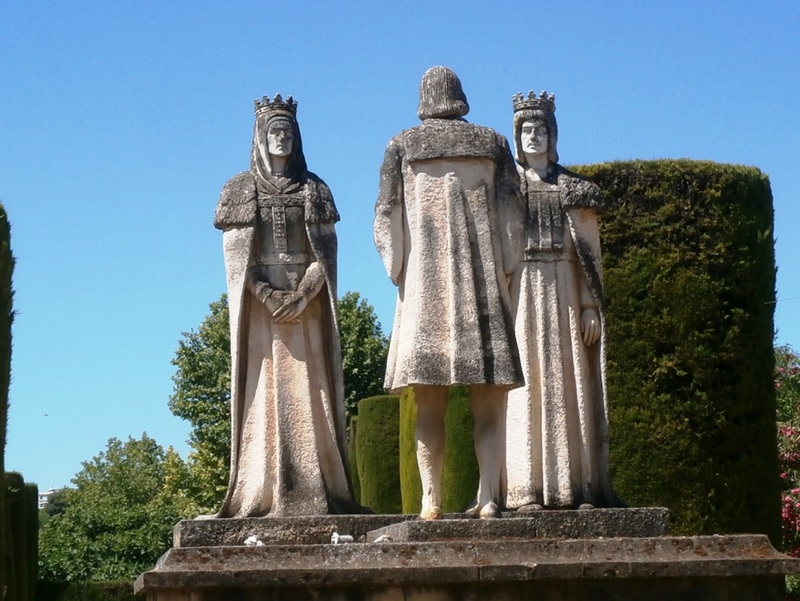 Statues of Christopher Columbus standing before Queen Isabella and King Ferdinand in the gardens of the Alcazar of Cordoba, one of many monuments honoring the memory of Columbus. Even with Spain’s rich history of art, culture, architecture and empire, I am left with gaps in understanding the country. For example, there are statues, monuments and tributes to Christopher Columbus throughout Spain. Why is there so little history told about Magellan, Pizarro, Balboa, Cortez, et.al., and the roles they played in building the Spanish Empire? I started reading about these explorers and conquerors in elementary school. One must understand something of their exploits to appreciate the history of all of Latin America, the Caribbean and The Philippine Islands. Where is the energy and drive that keeps a country’s economy vital and strong? While most of the industrialized world has more or less recovered from the economic depression of 2007-2011, Spain seems mired in record high levels of poverty and unemployment. Young people with college degrees are leaving Spain in record numbers to find work elsewhere, creating a brain drain that will take decades to restore. I have listened to stories of the work ethic of Spaniards who are more focused on clock-watching than productivity. Spaniards still prefer to take afternoon siestas, which made sense when people worked outdoors. However, what do employees who commute to work do for three hours when their place of work closes its doors every afternoon? I have read and viewed so many news stories about corruption in government in Spain at every level that I sometimes wonder how the the country has managed to build their wind turbines, high speed trains and solar farms. Then I read that energy rates and train fares continue to rise to cover expenses while economies of scale would suggest that costs should be coming down. Where is all the money going? I came to Spain with high expectations, and I enjoyed my time here. I am a bit pessimistic about Spain’s future as I mull over these puzzling questions. Whatever happens with Spain, there is no denying its appeal. It is a beautiful country and we have taken in much of its beauty during our six months as you can see from this brief video Florence created. I hope you enjoy the imagery as much as we enjoyed experiencing it. Hasta luego! © All photos are copyrighted by Florence Lince. Mike has always joked that he is on the ABC Tour. That stands for, Another Blessed Cathedral. In many ways he is right. We have visited the main cathedral or church in every city we have traveled too. However, there are reasons other than my just wanting to light candles. 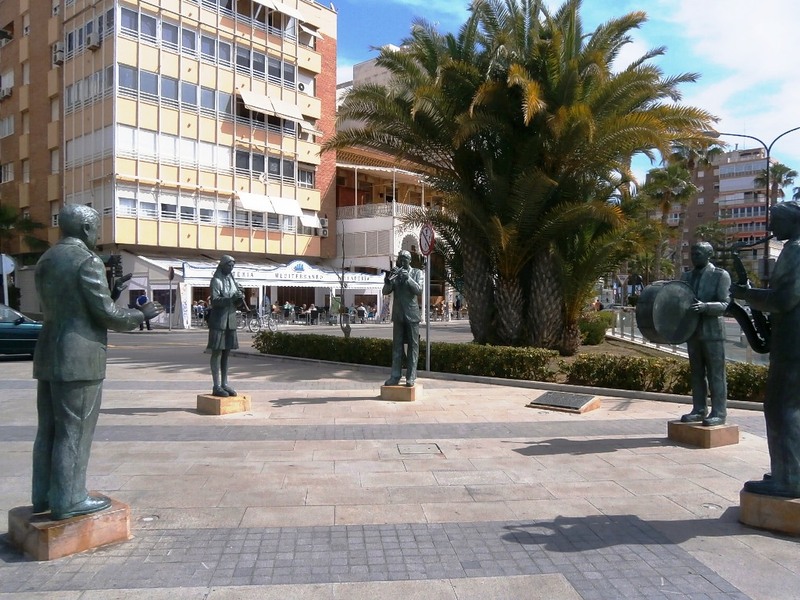 Life-size bronze statues of a director and five musicians stand on the Paseo Vista Alegre in tribute to the rich musical legacy of Torrevieja. This was the final week of the Tapas Crawl, the 10th Annual Ruta de Las Tapas. We set out for the town center to check out the annual Book Fair on the downtown waterfront. Florence and I are avid readers, and we were interested to see if there were many books in English available at reasonable prices. Granted, the local library has a decent English language section, mostly fiction. A range of restaurants would be serving their best tapas for whenever the hunger bug hit, but first a little shopping was in order. 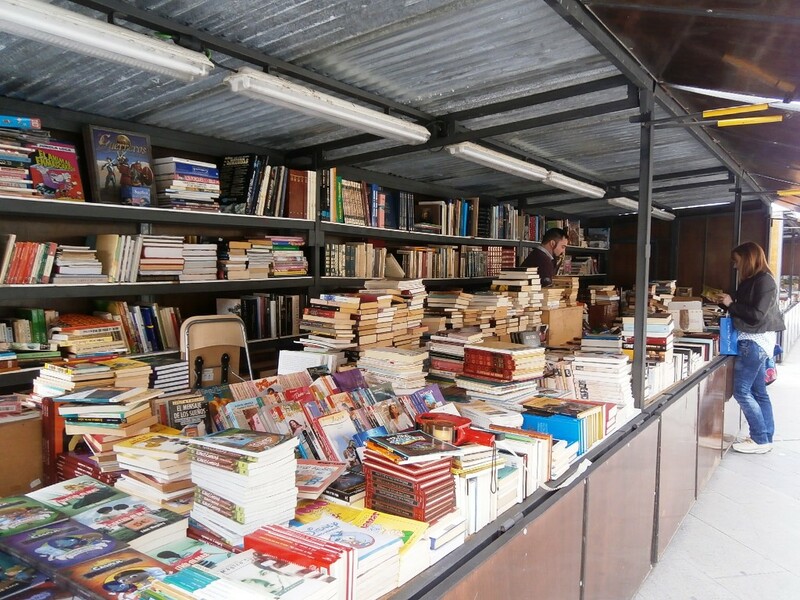 The annual book fair consists of six large book kiosks on the seafront pedestrian walkway. We were surprised to learn that Suzy and Rob, purveyors of the Bargain Books shop downtown, were the only outlet for English language books in town. I would have thought there would be demand for more given the large English expat population in Torrevieja. According to Suzy, that used to be the case. However, the other businesses folded, and now she and her husband have the last remaining English language bookstore. We had eaten light that morning. Then it was time to ‘tapa off’ our appetites. I was already salivating in anticipation of our return visit to La Mila-Grossa, the Argentine restaurant we had discovered the previous weekend. We made a stop at La Bella Lola, which offered an excellent toasted tomato and cheese tapa. 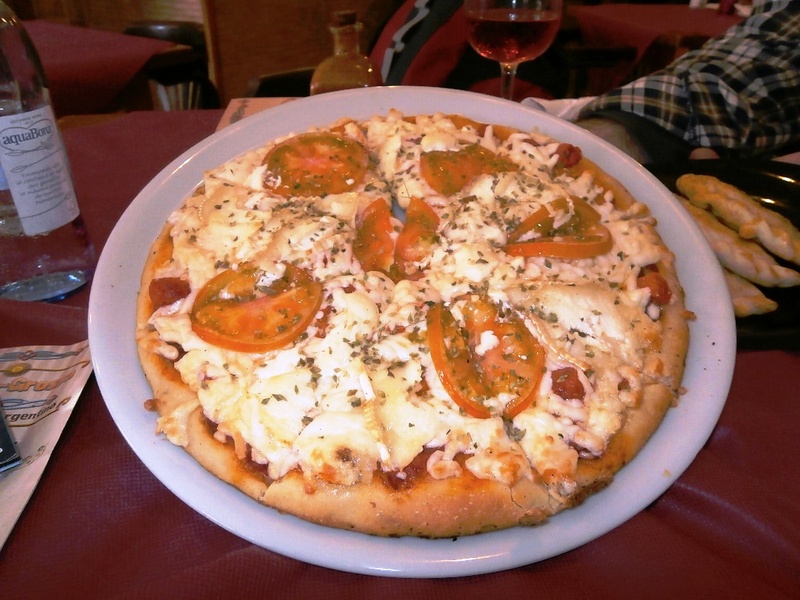 Next stop – La Mila-Grossa Restaurant. Empañadas with Salsa de la Abuela – The aroma told me I was in for a treat. We started with some fine appetizers. However, we had the main courses in mind. Florence longed for a vegetarian pizza, and I planned to make a meal of the house specialty empañadas. I had sampled them the weekend before, and the anticipation was killing me. 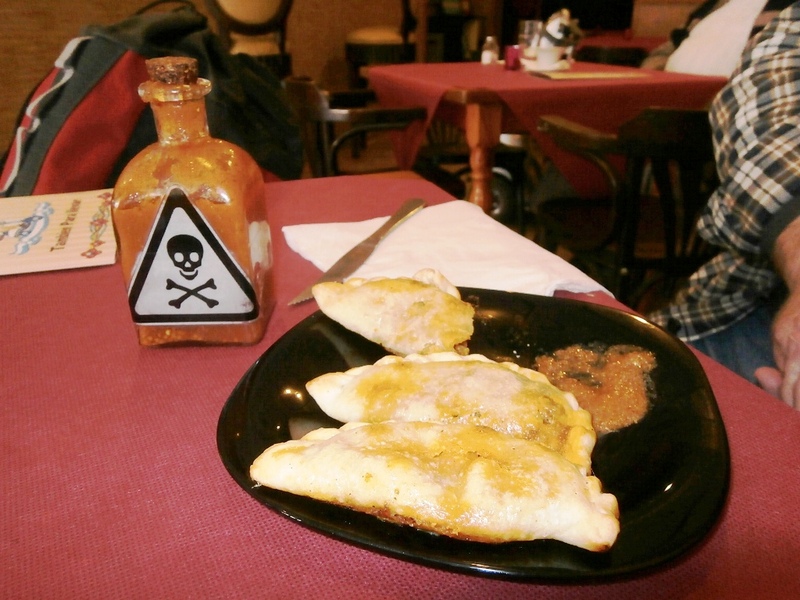 When the empañadas arrived, I inquired if they had hot sauce thinking I had spied some on a side counter. Our server, Mariano, asked if I wanted ‘picante’ – the hot stuff. Oh, yeah! Let me interject here that I love hot, spicy food. I have not tasted a decent hot sauce since we left Mexico over a year ago. Suddenly, a plain bottle with a generic skull ‘n’ crossbones sticker appeared on our table. I was as nervous as a teenager on a first date. Could this be the moment I had been waiting for? I put a taste on my fork and licked it off. A tense moment passed, and then a small fire started on the tip of my tongue. The juices that formed in my mouth were as sensuous as my first French kiss! I thought I heard angels singing. My heart beat and breathing sped up. It was delicious! The handsome, young Mariano made me a gift of his grandmothers salsa. I had a pleasant conversation with Mariano after we had eaten. He told me he was from a town near Mar del Plata, Argentina, where his mother lives. He now lives here in Torrevieja where his father’s family originates. As we were preparing to go, I asked if the picante sauce served with lunch could be purchased. ‘Le gusta?’ he asked, pleasantly surprised. (You like it?) Then he told me his grandmother makes it for the restaurant, and yes, I could have some. Mariano brought a generous container of the heavenly elixir from the kitchen. I asked him how much. He handed it to me and said, ‘Esto es un regalo para usted.’ (This is a gift for you.) Mariano had given me a gift of liquid gold which I now call Salsa de la Abuela, grandmother’s salsa. I had hit the jackpot! Muchas gracias mi amigo. Note: All photos are the copyrighted property of Florence Lince. Our home town of Torrevieja is a resort town full of parks, plazas and an array of restaurants and shops… and beaches. Spring in Torrevieja is a delightful time of year. The crisp breezes blowing off the continent and the brisk on-shore winds have given way to the bright sunshine and warmer days that demand we leave our jackets behind when we take a walk. People are heading to the beaches with their folding chairs and beach towels ahead of the crowds still to come when people seek refuge from the blazing heat of summer. The seasonal shops and restaurants are opening all over town. It is a time to celebrate spring. It is time for tapas. First stop – Las Salinas, an open air favorite spot for families. Their Magra de Ibérica was a delicious stew made with veal. Tu Aroma offered a piece of fried cod served over a zucchini wrap of peppers and onions, plus a grilled meat in a chocolate mole sauce. Fifty-six restaurants are each offering two tapas from which to choose during weekend one and two different tapas during weekend two. The weekends run from Thursday through Sunday and are available at either lunch or dinner time. The tapas are offered in addition to regular menu items and are advertised as standard or gourmet as determined by the restaurant. 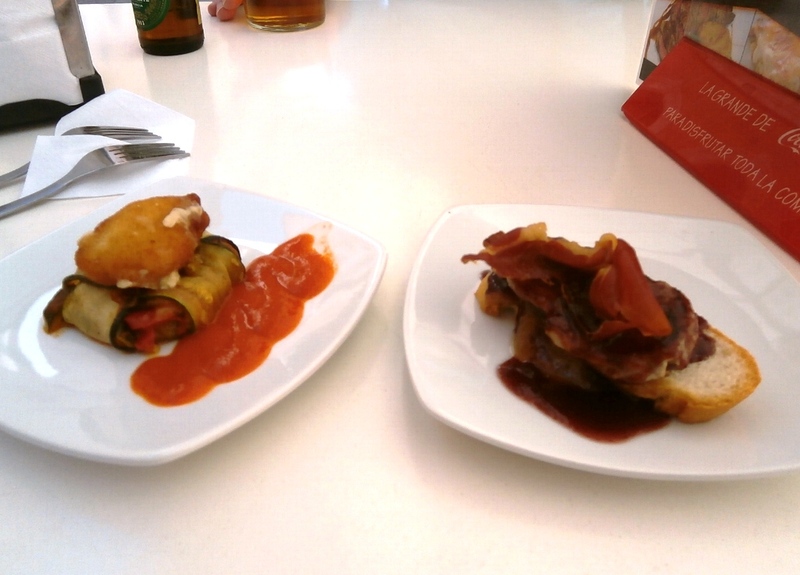 Standard tapas sell for 2€ and gourmet items sell for 2.5€, equal to $2.80 and $3.50, and include a choice of beverage. I ordered beer. Florence chose bottled water. The Mediterranean Café offer this baked dish made with chicken and potatoes. The second tapa was skewered ‘sepia’ which is Spanish for cuttlefish – similar to squid. No one has to pay an entry fee. 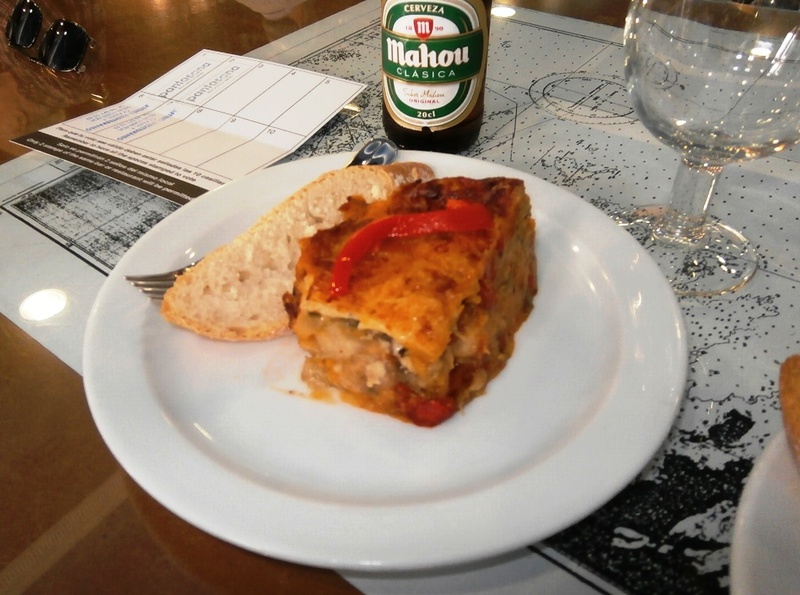 All that is required to participate in the Tapas Crawl is a few Euros, a good appetite and good walking shoes. Even though there are participating restaurants are all over town, most are concentrated downtown near the ocean shore. People are allowed to vote for their favorite tapas once they have sampled at least ten options at no fewer than five restaurants. Taj Mahal offered tapas Indian-style – deep fried vegetable mix that put onion rings to shame, and a shrimp roll made with sweet potato that was our favorite so far. 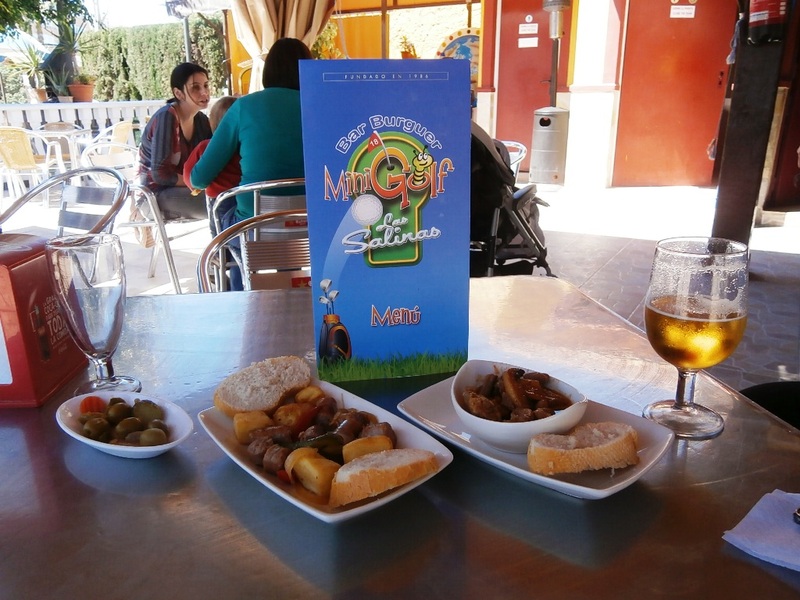 We visited four restaurants on a sunny Sunday afternoon, and we ordered both of the tapas offered at each stop, so that was about 5€ times four, a total of 20€ for the two of us to sample eight varieties of Spanish cuisine including tips and beverages. That was a pretty good deal. We are already thinking ahead to weekend number two, and one stop we passed on our way home is already at the top of our list. 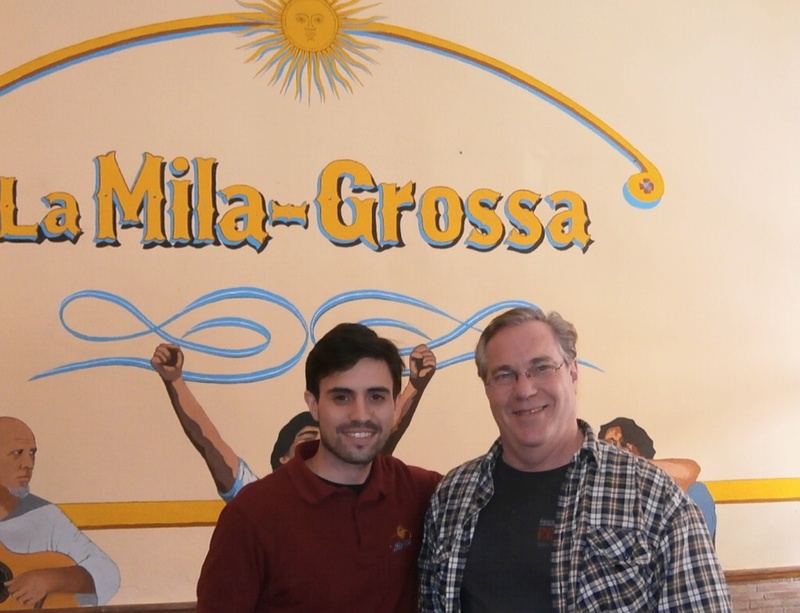 We were too full to sit at La Mila-Grossa, an Argentine restaurant. However, we ordered some of their empañadas to take home for dinner, and that was a fantastic gastronomic conclusion to our first Tapas Crawl. The insights revealed by our travels over the last few years have been nothing short of amazing. There have been so many beautiful places and interesting people. I continue to fulfill a lifelong desire to better know and appreciate the world we all share. I try to keep an open mind and to demonstrate my desire to reach out to people and to understand their culture, and I have learned that we are all not so different. My greatest love of the outdoors is the mountains. This was something I acquired at a young age as a hiking and climbing partner with my dad. I learned to love the clean air, the fresh water, the exhilaration of looking at the world around me from the highest perch I could reach, and the camaraderie that comes from sharing these experiences with like-minded outdoorsmen. Even though my legs are nowhere near as strong as when I was a constant hiker and backpacker, I dream of the heights when I spot snowcapped peaks on the horizon. 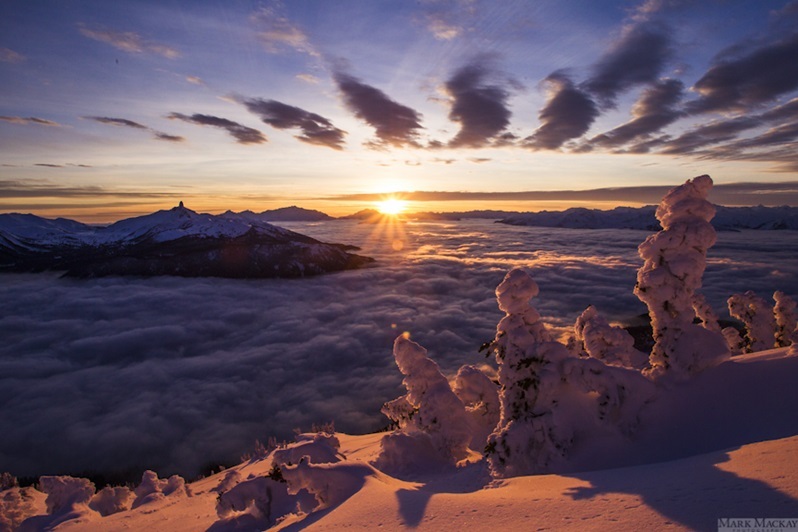 At least there is a chair lift to the top of one of my favorite peaks, Whistler Mountain, so I will still be able to visit the high alpine country even when I am too old to hike the trails. Not every day on the road is an adventure. There are health issues that crop up. I had to have a root canal performed on a broken tooth while we were in Mexico. I broke out in hives a few weeks back, an apparent allergic reaction that made me itch so bad that I felt like my whole body was one big mosquito bite. We also have money concerns, just like everyone else. I think the hardest part about traveling full time is missing family. I do not have a lot of family – two daughters and two grandsons. Other than my in-laws I am not close with any other family. I have often heard the phrase on television shows and from friends that ‘family is the most important thing.’ In my case that has hardly ever been true. My family of origin was never close. In one way or another every member of my family abandoned our relationship. My father was hauled off to the East Coast by my stepmother’s family, and after 2005 I never saw him or heard from him again. I found his obituary online a last year and learned that he passed away in 2009. He would have been 90. My mother never had so much as a memorial service. Maybe that was not a bad thing. I am not sure if I would have attended. My sister, two years older than I, just one day stopped communicating with me. We have had no contact with one another since 2008. All of these family failures sometimes make me wonder if I unwittingly sabotage relationships? Have I been a good enough father to my two daughters? Am I a good enough husband to my wife? Am I at fault for the failure of my first marriage of 28 years? I cannot take all that on myself. Relationships are a two-way street. All I know is I miss my daughters and my grandsons. They are on the other side of the world, and I cannot easily commute to see them. I love my life on the road. Every day holds the possibility of a new adventure. I love adventure, and I always have. I also love my daughters and my grandsons. I miss them. I know their lives are busy. Mine was when I was their age. Alas, not everything about our traveling lifestyle is easy. 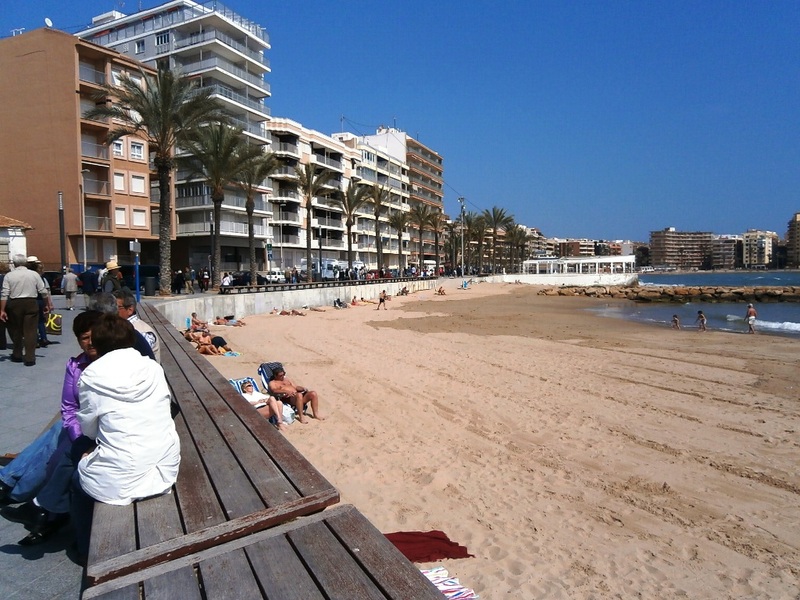 The shoreline of Torrevieja features beautiful sandy beaches and a mile long pedestrian walkway. Until about 1500 the Mediterranean Sea was ruled by pirates from maritime countries like France, Italy, and from as far away as Britain. Subsequently, during Ottoman rule in Spain, pirates from Algeria and Turkey known as Berbers were the predominant predators who attacked settlements along the coast. Even inland villages were vulnerable to the threat of pirates seeking food, treasure and slaves to row their galleys or to be sold for profit. 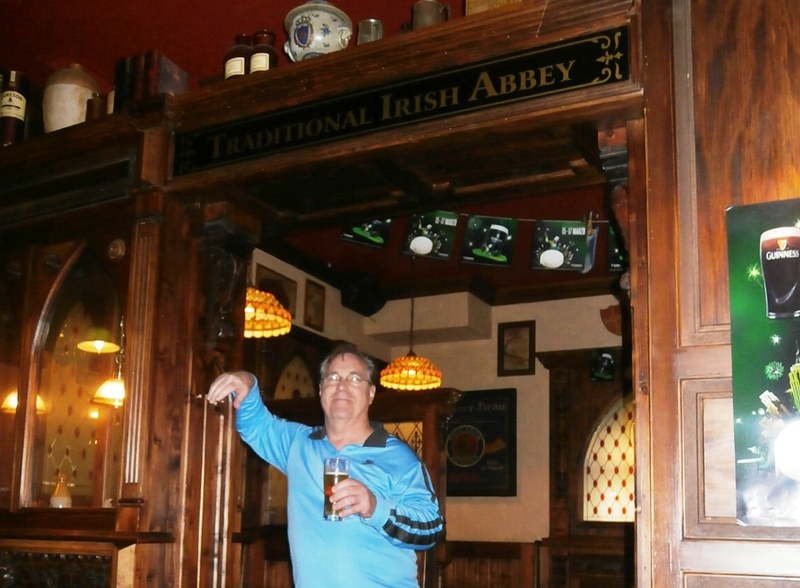 Perfect for St. Patrick’s Day – an Irish Pub in downtown Torrevieja! King Phillip VII, who ruled Spain in the early 1600’s, took a radical step to reduce the threat of pirates. Believing that Moorish descendants of the Ottoman days in Spain were sympathetic and perhaps even helpful to the Berber pirates, the king ordered their expulsion from Spain. Over 500,000 ‘moriscos’ were shipped to North Africa. Many of them became slaves. Some, either out of desperation or revenge, joined with the pirates. As a result, King Phillip was forced to take defensive measures. Shopping opportunities are plentiful in Torrevieja. 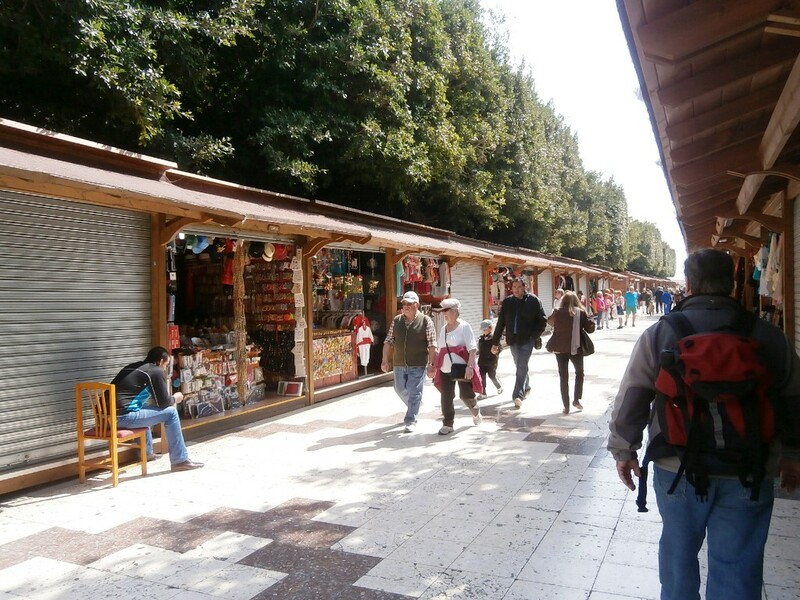 The walkway adjoins the beach walkway in the city center. Army engineers were tasked with building a coastal defense against marauding pirates. This defense was a series of coastal and inland watchtowers from the French border in the north to the south coast city of Cádiz. The towers were built on coast rocks, cliff tops or elevated platforms. Most were circular in shape evoking the image of a classic rook piece on a chessboard. A removable staircase was often used to access an elevated entry door so that it could be removed in the event of an attack. Guards who spotted threats would ignite a fire atop the tower which could be seen from a neighboring tower. It is believed that a warning from Cádiz west of Gibraltar could be relayed to the French border within three hours over a distance of 1,000 miles. Some towers were armed with artillery cannons. Many had shelter spaces for farmers or fisherman from nearby to seek refuge. Many of the towers in the Alicante Region have survived over 400 years and remain as historic landmarks open to the public. One such tower was built in the center of what is now Torrevieja, which translated means Old Tower. The original tower was destroyed by an earthquake. 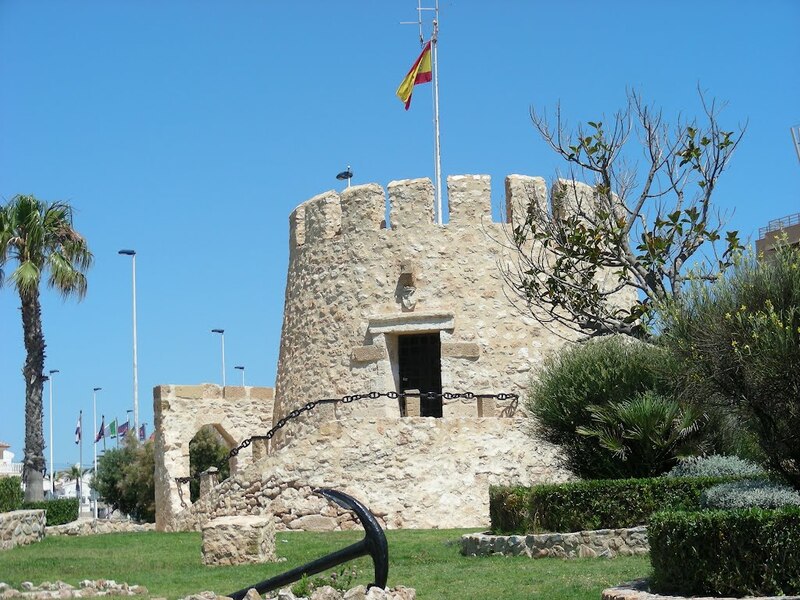 The only remaining tower in Torrevieja is the Torre del Moro located on the coast just north of the city center. This area was once a minor fishing village which grew with the development of a huge salt industry. Vast evaporation lagoons are still used to produce tons of salt annually for shipment around the world. Models are constructed, then submerged in the salt lagoon for three days. Salt crystalizes on the model creating a prized art piece. 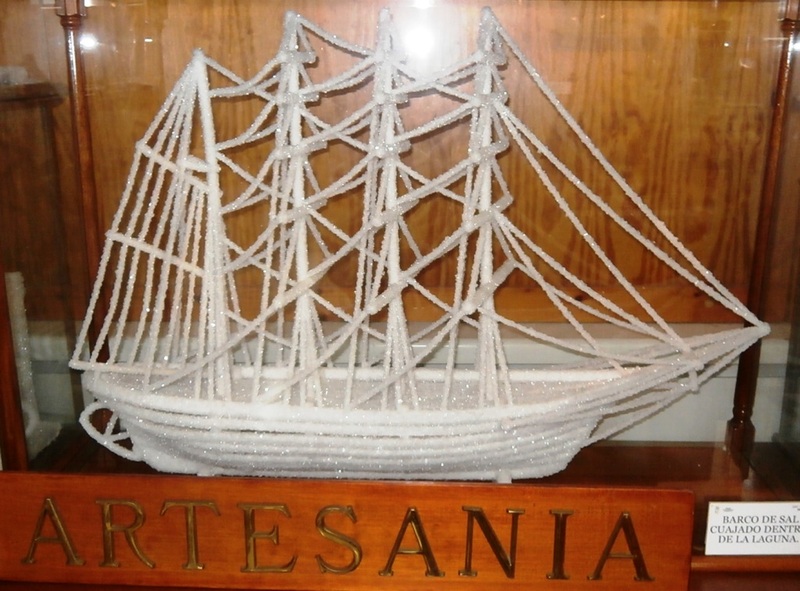 One of the signature souvenir pieces representing Torrevieja are salt ships. These models are prized gifts given to visiting dignitaries or as wedding presents. Other popular landmarks such as the Coralista Monument or one of the town’s signature cathedrals are also popular salt models. Many models are displayed in Torrevieja’s Museum of Salt located in the city center. 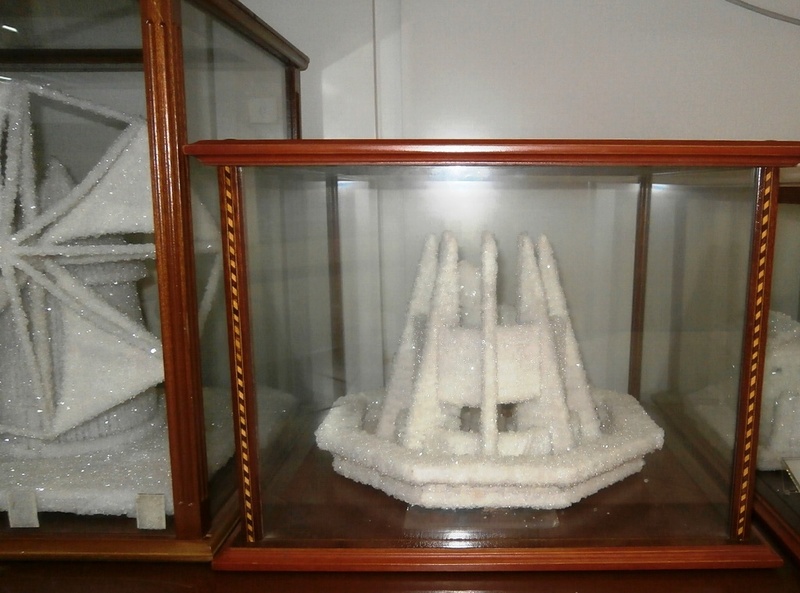 This salt model of the famous Coralistas Monument is among several on display at the Museum of Salt. The salt museum near the colorful sea walk is one of the many attractions that make Torrevieja a popular vacation spot on Spain’s Costa Blanca. Even though spring has not officially arrived, spring-like weather during the winter months explains the town’s great appeal, especially among the many northern Europeans we have seen. Many apartments still look sealed up for the winter, so I expect the beaches will soon be more crowded. In the meantime, we are enjoying the peace and quiet or our urban apartment. Given the number of friends and family dealing with this winter’s bitter cold, we feel duty bound to make the most of the many sunny days here. It seems that is the least we can do. All photos copyrighted by Florence Lince unless otherwise indicated.